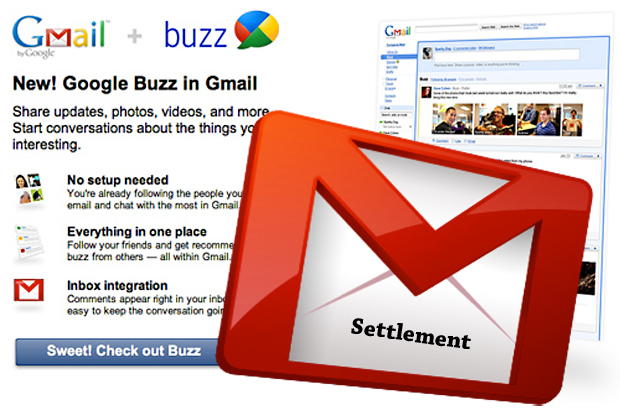 Gmail users received an email from Google yesterday notifying them that the company has settled a class action over alleged privacy violations by the Buzz service. According to the settlement, Google will pay $8.5 million into an independent fund that will be used to support Internet privacy education. According to the settlement, no one in the class action will receive individual financial compensation, except for the seven users who initiated the suit, who will get $2,500 each. The suit was initiated after Google launched Google Buzz and automatically opted every Gmail user into the new social network. Users objected that Buzz automatically “friended” them (to use the Facebook lexicon) with the people they emailed most frequently, thereby making their updates automatically visible to those connections. The objections centered around the fact that the people emailed most frequently weren’t necessarily people they’d want to connect to in a social network, like an ex-husband or a boss. A “fairness hearing”–in which interested parties can make arguments for or against the settlement–is slated for January 31. The judge presiding over the case will then decide whether or not to approve the settlement. Class members who want to be excluded from the settlement—which means they reserve the right to sue Google independently—must file for exclusion status by December 6. Settlement participants who want to remain in the class but register objections to it must file by January 10. Anyone who wants to speak at the fairness hearing must send a notice to that effect by January 10.